Thanks to the International Parking Institute for the opportunity to write an article slated to appear in the August issue of its member magazine, The Parking Professional. 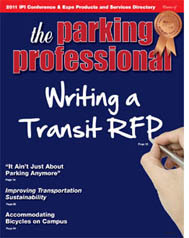 The article is due May 18, so I'm eager to interview a number of parking pros and related sources over the next couple of weeks. Parking design is one of the key elements to explore in order to gain a clearer picture of the contributing factors involved in vehicle-into-building incidents. The photos I've posted recently of different parking configurations offer my own two cents about what makes sense. But now it's time for the actual experts to weigh-in with their insights. I'm grateful to the IPI for a chance to invite some of its members into the conversation.